The biggest Transport Research Conference in Europe is coming closer. In less than four months, the Transport Research Arena 2018 (TRA 2018) will take place in Vienna, Austria. Registration is now open, the exhibition area is filling up, the programme is now being designed in detail, partners have been fixed and many things are right in the middle of being prepared. 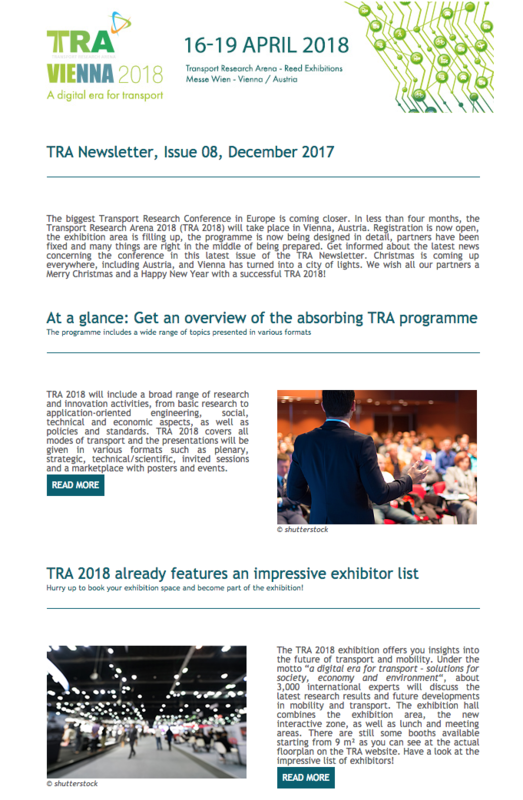 Get informed about the latest news concerning the conference in the last issue (Issue 8, December 2017) of the TRA Newsletter. Previous newsletters are accessible from TRA website. Not yet registered tp the TRA Newsletter? Here is the form.